It is, without question, my absolute FAVORITE food in the world. I fantasize about it. I could eat it every single day for the rest of my life and never tire of it. I LOVE IT. My problem is that I can never stop at one or two slices. This leads to me consuming massive amounts of Weight Watchers Points whenever I am near pizza. This is not good. So, I try to create recipes that allow me to satisfy my hankering for a cheesy pizza without overdoing it on Points. When I came across this Cauliflower Pepperoni Pizza Casserole Recipe on Pinterest, I knew that I had to try it immediately. I was skeptical, but the thought of a low carb casserole that might taste like pepperoni pizza and yet be low in Points? I was game to try. After a few attempts I switched up the original recipe and did my best to achieve a great taste, yet still keep it low in Points. I was thrilled with how delicious it was. It’s not going to taste exactly like pepperoni pizza, but it is covered in delicious mozzarella and pepperoni, and sometimes just that combo of flavors is good enough to keep me at bay. This healthy casserole recipe is loaded with protein and fiber. I will for sure be making this again and again! 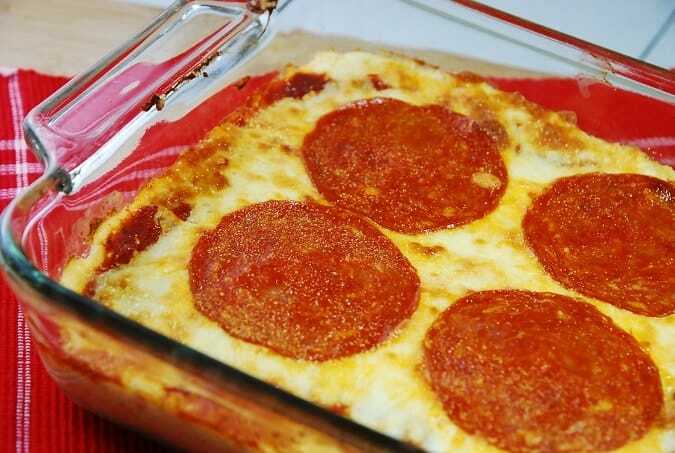 Tasty and low carb, this pepperoni pizza casserole uses cauliflower puree as a base instead of pizza dough. A unique texture with a fantastic flavor that helps satisfy your craving for pepperoni pizza in a much healthier way. Preheat oven to 375 degrees. Spray an 8 x 8 baking dish with non-fat cooking spray. Using a vegetable steamer, or the microwave, steam cauliflower until tender. Transfer hot cauliflower to blender or food processor and add in butter, half and half, 1 tsp garlic powder, ¼ cup mozzarella cheese, 1/ 2 of the pepperoni slices, and salt & pepper. Puree until smooth. Pour cauliflower puree into baking dish. Use a spatula to even out the surface. Top with the pizza sauce, and use a spoon or spatula to spread it evenly over the cauliflower, making sure not to mix it into the cauliflower. Top with mozzarella cheese, pepperoni and remaining tsp of garlic powder. Let cool for about 10 minutes. Cut into 4 equally sized pieces and serve. I thought this recipe was really yummy!!! I didn’t expect for the cauliflower to harden like pizza crust because the description says it is a casserole. So as long as you go in to it with that understanding, I think you will find the flavors really good!!! I look forward to eating the left overs the rest of the week. I think some may have gotten the wrong impression that this was supposed to come out crispy like pizza…it is a casserole so I guess the thick purée consistency is appropriate. Whether or not the end product was good is a different story. For pizza crust made with cauliflower, you definitely have to wring the water out after steaming it as someone else mentioned. But as a casserole I just didn’t enjoy this like I thought I was going to. I also wouldn’t recommend it as a main dish…this IMO is more a side dish. Overall I wouldn’t make it again. I saw a lot of variations on this on the web…The garlic powder was supper overwhelming and the flavors of seemingly yummy ingredients just didn’t translate. I also tossed the rest which is against my religion. I applaude you for what you do here though and am excited to try other recipes. The broccoli cheeses chicken was incredible! Keep up the good work! Ew. Do not make this. It comes out like baby food. I couldn’t get the puree to thicken at all. What I can’t figure out is why the original recipe this post links to has all positive comments. This was not enjoyable at all. I was all set to make this recipe and I glad that I reviewed the comments prior to making it. I say that because I was going to feed it to my husband and 12 year old stepson. Luckily I hd a back up plan for them (chicken parm). I did decide to make a cauliflower pizza crust (this was after I had already cut my cauliflower into florets for the casserole). Luckily I was still able to make the pizza. It turned out WONDERFUL…however, my crust wasn’t stiff enough to pick up and eat as a slice of pizza. Next time I will spread the crust out more than just 9-12 inches as the recipes called for. Have to agree with Laura…. This recipe is awful! I have had such successes with your other recipes but the remaining part of this dinner is going in the garbage. Thanks for all the other good ones! This was the grossest thing I’ve ever eaten. All I could taste was the cauliflower, and I love cauliflower, but puréed, yuck. I have loved all the recipes I have made from this site except this one. I have the same question as the others. Is the puree supposed to get solid at all? Mine is very smooth like mashed potatoes. Hi! I made this tonight and the flavor is great but the purée did not get at all solid. The flavor was amazing and I will definitely make it again but is there any suggestion to getting it to e a little more solid? The pepperoni in the picture does not look like the mini turkey pepperoni I have bought. Did you use those for the picture? Also, how many slices/ounces would it be to use normal size turkey pepperoni? Thanks! Oops sorry. Just read the quick notes re: the deli pepperoni. Does the cauli puree become “solid” like a crust at all? Or is it just soft and scoopable? I just made it and it came out with a hummus texture. Any suggestions for how to make it more solid. That’s pretty much the texture that it is supposed to come out like. So it’s more like a casserole, as opposed to solid crust pizza. You’d need to take just about all of the water out of the cauliflower. I’ve made a pizza crust out of cauliflower before and I was actually able to pickup each piece – was shocked I didn’t need to eat it with a fork! So, cool the cauliflower until it’s just barely warm, then dump it in a flat cotton kitchen towel. Pick up the corners of the towel and squeeze as much water out of it that you can. Do this over the sink as more water will come out of it than you think! Twist it in the towel to get even more water out. Continue with the rest of this recipe. I think should help it be more solid like a crust.